These rich, fudge brownies have a nice crusty top, made with oat flour and coconut oil and are loaded with chocolate flavor. When I was pregnant with our daughter a few years ago I ate oatmeal almost everyday as my second breakfast. This pregnancy has been so different in many ways, but when it comes to oats, I can’t seem to eat enough. 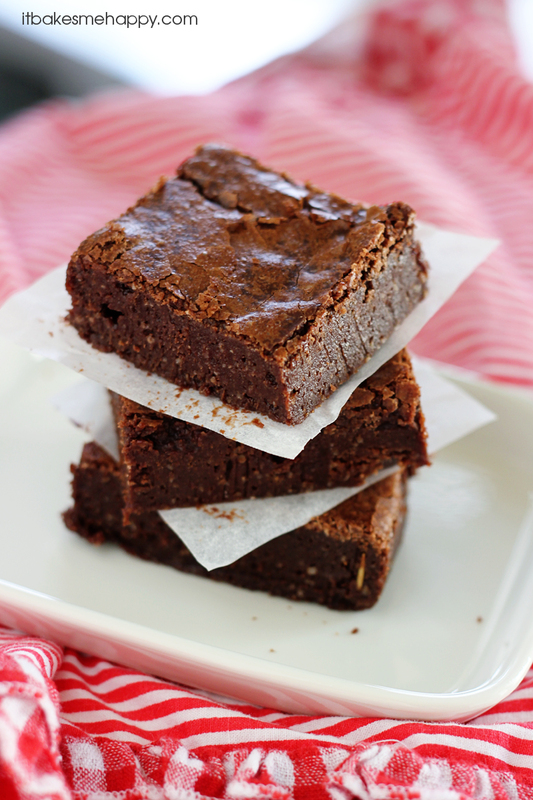 Oatmeal, smoothies, no bake cookies and today’s recipe – brownies. I’m putting them in everything! I have mentioned one of my favorite cookbooks before, Brownie Points by Lisa Slater and this recipe is my take on one of her go to recipes. I opted to go for coconut oil over butter and to try some oat flour; the resulting brownies are fudgy, with a nice crusty top and loaded with chocolate flavor. Next time you are having a brownie craving I highly recommend whipping up a batch of these bars. Enjoy and happy baking! Preheat your oven to 300 and line an 8"x8" baking pan with parchment paper. In a medium sized sauce pan melt the coconut oil over low heat, add the chocolate and stir until smooth. Remove from the stove and stir in the sugars. Add the eggs one at a time, mixing until we'll blended. Add the vanilla, flour and sea salt; mixing just until incorporated. Spread the batter into the pan and bake 30-32 minutes, edges will be set. Cool in the pan completely, slice and serve. Mmm I could go for some brownies right now! Oh, those sound heavenly! Love me some brownies!!! I was wondering if you’d be willing to link these up and any other recipes or posts that you wish that are “spring” themed to our Spring Fling, Blogger-Style link-up (you can find it on Natural and Free)? I think brownies are always in season, and we’d love to have you join us! If you can’t, I totally understand, but figured I’d ask. Take care! These brownies look so moist and delicious! If I made this I might just eat the whole batch! Cathleen they are so good and very tempting! P.S. Your website is beautiful! These brownies look absolutely delicious!!!!!! I’ve never used oat flour before, I’ll have to look for it next time I’m grocery shopping! These look wonderful! Oh wow… these look so yummy! 🙂 And I love that you used coconut oil in them. Has anyone tried these? I agree with everyone, they look delicious, just wondered how they taste?